Over the sample period, the number of Bitcoins more than doubles to over 16 million. As of 2017, Bitcoin hourly creation rate is about 60, and over 75% of all possible Bitcoins have been created. Average annual growth rate for Bitcoin wallets is about 84%. Empirically, Metcalfe’s law explains Bitcoin price well over the full sample period, with R-squared statistic 0.78 (see the chart below). In other words, the model based on the law explains 78% of the variation in Bitcoin price. 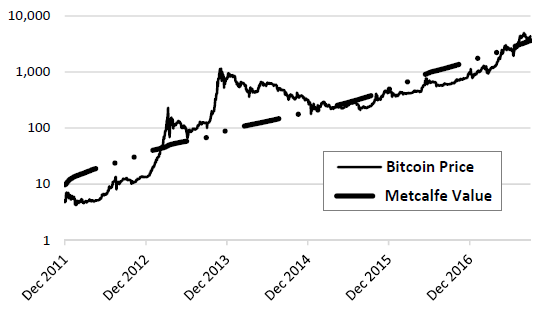 However, Metcalfe’s Law does not explain Bitcoin price during 2013-2014. Moreover, excluding 2013-2014 boosts the explanatory power of the model based on Metcalfe’s Law to 98%, reinforcing belief that someone manipulated Bitcoin price during 2013-2014. The following chart, taken from the paper, tracks actual Bitcoin price and its value as modeled based on Metcalfe’s Law over the full sample period. Results indicate overall success for the prediction, but a notable mismatch during 2013-1014. In summary, available evidence suggests that a simple model of Bitcoin price based on Metcalfe’s Law is useful for understanding and perhaps predicting Bitcoin price. The sample period is short, and the Bitcoin market is immature. As noted in the paper, modeling assumptions about Bitcoin activity and wallet use may be incorrect. Also, application of Metcalfe’s Law involves a “constant” of proportionality that may not be empirically constant. The study does not explore use of the model to trade Bitcoins.